As a child, Dana Michel would drape a yellow towel on her head in an attempt to emulate the blonde girls at school. As an adult, she revisits the imaginary world of her alter-ego in a performance free of cover-ups or censorship. Yellow Towel digs into black culture stereotypes, turning them inside out to see what is revealed. From deep memories a strange creature slowly emerges that adjusts to its surroundings in a slow and disconcerting metamorphosis. Initially attracted by the aesthetics of fashion, video clips, queer culture and comedy, Dana has made a strong mark as part of Montréal’s independent dance scene. Yellow Towel has been touring widely since it premiered at the Festival TransAmeriques in Montréal in 2013. Last year it was rated one of Time Out New York’s top ten best dance shows and won a special award at ImPulsTanz in Vienna. 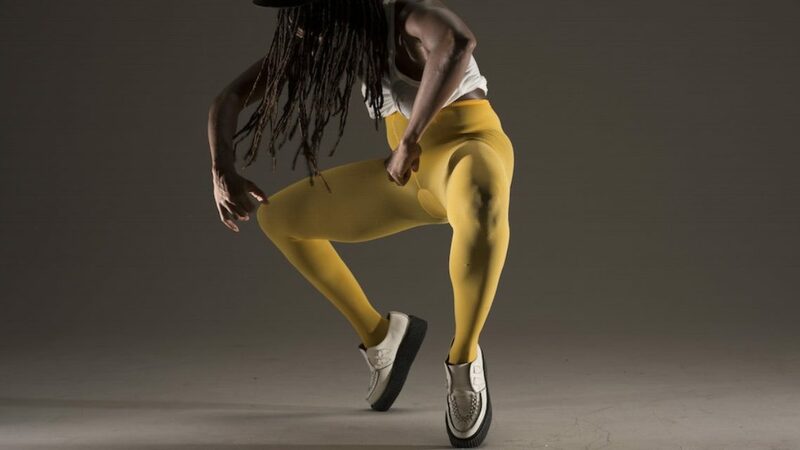 Yellow Towel was co-produced by Festival TransAmeriques and Studio 303 and was developed through residencies with Compagnie Marie Chouinard, MAI, Le Chien Perdu, Usine C, Circuit-Est centre chorégraphique, Studio 303 and Agora de la Danse. Yellow Towel has been supported by Conseil des arts et des lettres du Quebec, Canada Arts Council and the Québec Government Office in London. Dana Michel is supported by Daniel Léveillé danse cie through his sponsorship project (http:danielleveilledanse.org).